Filled with tips, ideas, calls to action, and brief exercises, these cards will be a daily go-to as you learn skills needed to enjoy the ups - and navigate the downs - of real-world life. And best yet, because skills take repeated practice, you cannot outgrow this deck, you can only grow with it! Lane Pederson, PsyD, LP, DBTC, has provided DBT training and consultation to over 10,000 professionals in the United States, Australia, South Africa, Canada, and Mexico. A real-world practitioner, Dr. Pederson co-owns Mental Health Systems, PC (MHS), one of the largest DBT-specialized practices in the United States. At MHS Dr. Pederson has developed DBT programs for adolescents, adults, people with dual disorders, and people with developmental disabilities. He has served as clinical and training director, has directed practice-based clinical outcome studies, and has overseen the care of thousands of clients in need of intensive outpatient services. 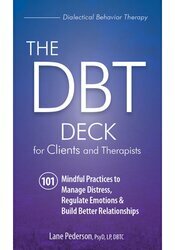 He is the author of three DBT books. Lane Pederson is not affiliated or associated with Marsha M. Linehan, PhD, ABPP, or her organization.